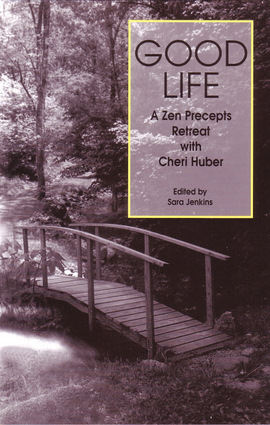 Good Life presents the Buddhist precepts as signposts on the path to discovering human beings' inherent goodness. It offers concrete ways of transforming real-life difficulties into freedom. Sara Jenkins worked as an art historian, director of an oral history project, and managing editor of a medical research journal before plunging simultaneously into freelance life and Zen Buddhism fourteen years ago. Since then she has occupied many points along the editorial spectrum, including copy editor, illustrations editor, nonfiction author's editor, book producer, and writer. She lives in Lake Junaluska, North Carolina. Cheri Huber is the author of 19 books, including There Is Nothing Wrong with You, When You're Falling, Dive,and Time-Out for Parents. She founded the Mountain View Zen Center in Mountain View, California, and the Zen Monastery Practice Center in Murphys, California, and teaches in both communities. She travels widely and often, leading workshops and retreats around the United States and abroad, most recently in Costa Rica and Italy. She founded Living Compassion in 2003, a nonprofit group comprised of There Is Nothing Wrong With You Retreats (based on the book); Global Community for Peace: The Assisi Peace Project; The Africa Vulnerable Children Project; and Open Air Talk Radio, her weekly call-in radio show originating from Stanford University. She lives in Murphys, California.